If we “won” the Cold War, why is our society beginning to resemble “post-Soviet” Russia? Recently in Moscow, Russia's OMON Special Forces police, which is sort of a national SWAT unit frequently deployed to the battlefront in Chechnya, put on an exhibition of its hardware and tactics, which include sophisticated bone-breaking techniques. OMON has recently received the mission of dealing with “riot control,” and its lead-handed tactics in dealing with peaceful political dissidents have earned some negative press. So the exhibition served the dual purpose of PR work and intimidation. "This is a warning," OMON colonel Vladimir Antonovich explained. "We want to show off what we can do." 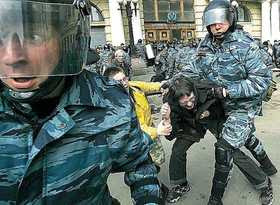 Political dissidents in Russia are painfully aware of what the OMON police can do; many of them were on the receiving end of the unit's brutal tactics during a recent anti-Putin demonstration in St. Petersburg. Hundreds were arrested and detained, and probably at least as many were beaten, kicked, and otherwise assaulted by OMON troops dressed in riot gear. That's how things are in Russia – and measured in historic terms, this type of treatment represents a dramatic net improvement over past performance. The trend-line in the United States, however, has run in the opposite direction. The funny thing is that OMON also invokes “hostage situations” and “terrorism” to justify its approach as well. 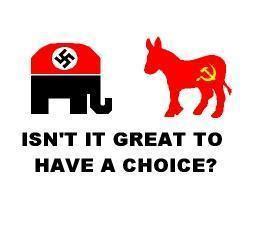 So what we're seeing is the mellowing of the regime governing “post-Soviet” Russia, from unalloyed totalitarianism into a superficially democratic form of authoritarian despotism, while the United States mutates from a republic into a quasi-Soviet corporatist police state. The pigs and farmers have become indistinguishable from each other. And the two nations they rule are being plundered by them in remarkably similar ways. By 1991, Russia scholar Anne Williamson recently told me, “No one [in the Soviet ruling elite] any longer believed the ideology, and certainly the nation was mismanaged under it, and approaching insolvency. (Sound familiar?) But Russia did not have a vibrant economy (it's functioning economy was "hidden," and that bit was relatively vibrant) to protect - but it did and does have tremendous national assets, and an industrial base. Naturally those assets were the object of the `privatization.' However, you can't pull a stunt like that in the US as presently structured...so this indirect route [buying up `public assets' through foreign intermediaries] is a good one for them, very clever. Nonetheless, both methods do/did involve the purchase of PUBLIC assets." The route we're taking may be a little different, but we're going to end up pretty much exactly where Russia is right now: Ruled by an entrenched nomenklatura defended by a brutal military/security establishment, with our wealth controlled by a corrupt trans-national elite. Which seems to be exactly what Norman Dodd was warning about a half-century ago. Some perfectly sober and respectable people don't find Norman Dodd's testimony to be credible; they believe that the political gene-splicing that has made interchangeable pig-men out of the American and Russian ruling elites is a result of evolution, not conspiracy -- that is, malevolent intelligent design. I don't agree, but I do respect that opinion – as long as it is held by people who admit the reality of what's happening to us. Who won the Cold War? The Pig-Men did. Make sure to check out The Right Source! Even OCP cops would be hard pressed to combat what I just saw. Seems like the new boss is same as the old boss. First, a comment for the previous thread. Will, your link is still absent from the previous thread, so I'll comment on it here. Indeed, the WayBackMachine site is indispensible for researching old websites, especially in regards to finding old pages long ago expunged. I've used it extensibly myself. Concerning the ADL, we see eye to eye on it. I mentioned the ADL in another blog comment forum in 2005 and have for many years viewed that radical organization as a Bolshevist communist organization, which believes that somehow by repressing and oppressing any so-called "anti-government" group that Jews will meanwhile be protected and live in safety and security. And don't forget SLATT (State and Local Anti-Terrorism Training). Interestingly, the Militia Watchdog site now just points to the main ADL site. Here's the former site. Medved, who I think would clean Bush's derriere if asked, has been having conniption fits over people talking about a NAU and the NAFTA Superhighway. He claims it's all fairy tales His radio listeners seem to be giving him an earful apparently so he responded with this open letter. It's seemingly odd that among people interested in national "mergers" and consolidation towards the ultimate goal of world government (even with no descriptive adjectives applied) that it's always the United States alone that must be "altered" for some odd reason. Actually, it isn't "odd" but to the average street commoner, who doesn't or can't read between the lines, it would be odd and incomprehensible. To the discerning, however, it's obvious that these folk, who are at the helm in foundations like Ford, MacArthur, Rockefeller, etc., are Trotskyite socialists. I guess what's amazing to me is that too many commoner folk seem to think that those in authority or those in lofty positions are benevolent and are of good character because of that position and station in life. Is it the fact that these particular thugs are largely white, clean-cut, and attired in leisure suits and not largely black, unkempt, and attired in "Hammertime" britches with their crack cleavage revealed? Of course, it is. Whatever happened to the maxim "Don't judge a book by it's cover?" Well, actually, you can more often than not judge accordingly and be dead on. Even so, perhaps, the maxim should of been "Don't judge a book ONLY by its cover, but the total package." "Anyway, it seems that Jews aggregately, for some inexplicable reason, given the bloody evidence to the contrary, always seem to believe the State will be their perpetual protector.."
Excuse me?? What ""Jews" are you referring to here? Both Ayn Rand and Murray Rothbard were born Jews and I cannot think of two greater enemies (OK, Will Grigg, but he's not Jewish) of coercive, nanny-State power. Let's not forget "Jews for the Preservation of Firearms Ownership". They certainly don't seem to display a blind faith in government. It might not be good to paint with too broad a brush. Rather than despising "commoner folks", perhaps we should follow Thomas Jefferson's admonishment to educate and inform them. their donkeys and wooden hoes. 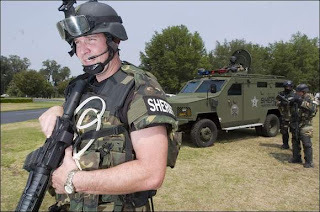 Below is yet another article from a "commoner" news source that is apropos to much of what Will has been saying in this blog regarding the militarization of Law Enforcement in the US. DD, maybe there is hope in that the commoner at least is garnering the knowledge of what is going on. I found the Anne Williamson quote very intriguing, but it begged for further explanation. Why was the (alleged) privatization of Russia during the 1990's a "stunt"? Who are the "them" that are using foreign entities to buy-up public assets? It seems strange that we are less afraid of overt socialism in the form of government owned assets, than we are to turn these same assets over to corporate ownership. Yet I agree that something isn't right about this type of privatization. I've begun to notice what I think is a flaw in the thinking of most libertarians: They often ignore the transient. The path taken to privatization is just as important as the final goal. Excuse me?? What ""Jews" are you referring to here? Are you serious? Are you denying that influential Jews do not think most highly of the State in general? And specifically, a socialist state? ...I could name many more if you like. hr, I'm simply stating what should be known to all. In any event, in case you thought otherwise, I'm NOT one of those who shuts up, folds up, and hides in the closet when someone utters the "anti-Semite" smear on anyone who criticizes or opposes individuals that just happen to be Jewish, or organizations that just happen to be top-heavy with Jews. The substance is always what counts, whether Jews or Gentiles are the enablers, matters not. If folk are truly and responsibly freedom-minded, they'll not discriminate in exposing and opposing all statist individuals and organizations, whether they just happen to be Jewish or not. It just so happens that many of the most influential individual agents provocateur in our society are Jews, and the attendant orgs, top-heavy with Jews. Why? Because like I said in the earlier post, they earnestly believe the State is their ultimate protector, contrary to the bloody evidence demonstrated to the contrary. Both Ayn Rand and Murray Rothbard were born Jews and I cannot think of two greater enemies (OK, Will Grigg, but he's not Jewish) of coercive, nanny-State power. I never said there were no exceptions to Jews being socialists and big government supporters and enablers; there rarely is in any matter being discussed. The orthodox religious Jews, like Dennis Prager, I'd count as exceptions for example. Howevrr, he is unfortunately a pro Iraq War Bush bootlicker. Anyhow, those exceptions don't invalidate the general rule in the slightest. Again, I said aggregately, that is, taken together collectively, as a whole, they are statists and big government supporters. Who despises them? Unless one or more of us here is in a lofty, influential, and/or powerful position, we all here are "commoners." As for my frequent use of the term, I use it to make the marked distinction between influential and/or powerful folk who assist greatly in shaping the cultural landscape - whether they be politicians, entertainers, corporate CEOs, etc. - and the white/blue-collar working class folk crystal clear. DD, maybe there is hope in that the commoner at least is garnering the knowledge of what is going on. I sure would like to think so, CK. The story is somewhat positive, but are the people "attacking" symptoms or the problem itself, though? It seems by that story that the people are complaining of the "warrior culture" of the LAPD. Police departments don't define culture, the commoners do. Most of the LA coppers come from the working class neighborhoods, after all, not Beverly Hills nor the Hollywood Hills. Many seem to think that those who frequent blogs like Pro Libertate or Lew Rockwell are a significant number of the commoners and that those folk are supporters of true liberty and bridled freedom. IOW, a significant impacting number among the 300+ million folk in this country. Some are, but most are not. Folk like that are actually a tiny fraction of the total population, even if the number of folk who hit these sites is sizable in toto. Otherwise, you'd see MANY more Libertarian, Constitution, or at least genuine constitutionalist Republican/Democrat Party (i.e. Ron Paul) votes caste in local, state, and national elections; Hollyweird taking a major financial hit; local, state, and national government being reined in; etc., etc. None of it is happening. Yes, there's always possibility of real change. It's just that it's the commoners that need to take the steps toward making a change. They are the real actors after all that either desire enslavement or oppose it by their actions (or inactions), not their meaningless words.